The image above was posted on numerous websites including the BBC. It claimed to show large scale slaughter of Tamils due to indiscriminate shelling by the Sri Lankan Army (SLA). The image clearly shows that there is no damage to trees or permanent strucutres. The white structures on the left are tents housing displaced civilians held by the Tigers against ther will. No sign of aerial attack or artillery fire. The right side image clearly shows signs of a mass evacuation of the makeshift shelters, probably temporary camps of the hostages who were dragged by the retreating Tigers as a human shield. If the Sri Lanka Air Force bombarded this area or if SLA fired artillery, how could only the permanent buildings be left intact? The above image is also used on the The Times. 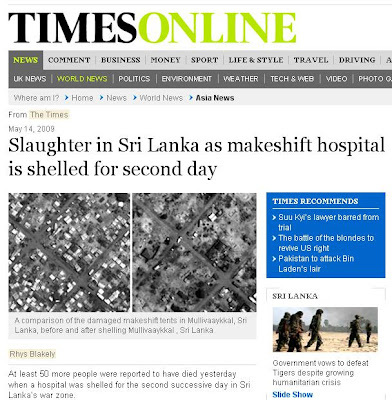 This is just one example of the falsifying imagery used by Tamil Net, often a source of news and pictures for major news channels, and the pro-LTTE pressure groups, to serve their self-fulfilling warnings of an imminent "bloodbath" and "humanitarian catastrophe" in Sri Lanka. Closer examination of the still and video footage put out by these institutions and pressure groups is bound to give much more evidence of how the viewers and policy makers the world over are being misled by such calculated false imagery. There was similar misleading by photography of alleged craters caused by aerial bombardment from satellite imagery claimed to be from the United Nations. The UN Office in Colombo later admitted that these pictures were not released by it to any media or other sources, and the authenticity of what was claimed could not be established in the absence on ground verification. When this conflict finally ends it will leave a lot of people red faced and embarrassed. Satellite images which apparently proved that Sri Lanka was killing Tamils in the thousands by means of indiscriminate shelling/bombing - apparent 'leaked' by UNOSAT - turns out to be be a planned exodus by the Tigers to create the impression of a large scale displacement. And not necessarily evidence of large scale bombing campaigns to kill the Tamils as some would like us to believe. Similar images and other doctored videos are the grounds on which the world - including the UN - claimed Sri Lanka was shelling it's own people intentionally, and creating a bloodbath. This doesn't necessarily mean there are no casualties. It is war after all. British Foreign Secretary David Miliband during his visit to Sri Lanka displayed the ignorance of a man who knows nothing about foreign affairs or the meaning of the word 'Diplomacy'. Miliband armed with so called 'evidence' interrupted Gothabaya Rajapakse (Defence Sec.) as he was describing the rescue mission and the 200,000 civilians who they have freed from the clutches of the cornered Tigers. Miliband claimed in a cocky and rather arrogant manner that the UK had credible information that proved civilians were being harmed by the Army. Details of their conversation with Gotabaya Rajapaksa, the Defence Secretary, emerged this morning in a Sri Lankan newspaper and on the website of the Defence Ministry . The report said that Mr Miliband interrupted the Defence Secretary as he was describing how the army had rescued 200,000 civilians from the tiny strip of northeastern coastline where it has pinned down the Tigers. Mr Miliband said that Britain had credible information that civilians were being harmed in the army’s artillery raids on the area — now covering only 3.8sq miles — in which the United Nations estimates there are still 50,000 non-combatants. The Defence Secretary — who is also a US citizen — said that Britain should not be “duped” by a disinformation campaign masterminded by the Liberation Tigers of Tamil Eelam (LTTE), as the Tigers are officially known. “Even BBC is dishing out LTTE propaganda material without verification,” he was quoted as telling Mr Miliband. Mr Miliband responded that his claim was not based on BBC reports but on credible information from sources on the front line. “Apparently annoyed, the Defence Secretary said anyone who knew the LTTE would not believe that any reliable information would emanate from that area under its jackboot,” the report said. Tamil people will never learn. I am Tamil and I know people love to hate the sinhala government. The Times has also fallen for Tamil Tiger propaganda. The government has said it took 2 1/2 months longer to finish the mission because they had stopped using heavy weapons. tmorgan save it thambi..I have seen your username on all sri lankan articles and videos spreading Tiger proaganda.. Is your name Arjunan by any chance? See...I know..game over thambi..
How many times did the British commit massacres in India? how many times did they quash, crush and destroy those who rose against them? How many times? Over how many years? Over how many decades? Over how many centuries??? The Tamil people are nothing like the Sinhala bigots. Your a small minded people, ill-educated people and obsessed with your fake version of Buddism. 30 years ago Sinhalese people spat at me and thought that I could never fight back. I was not alone. The Tamil Tigers fought you brutally, avenged our dead and now you have a country that was once ahead of singapore, behind even Bangladesh. We had nothing then, we have more now than we did then. Sri-Lanka is fighting against the entire western world, the same world its economy depends on. You Sinhalese keep setting up websites that offer no hope. You will see in time. The Sinhalese never thought the Tamil Snake could bite back. We bit and bit hard. Your president is so scared that he will not let anybody into the caps unless they are. Your Sinhalese nation is divided, even the government is attacking middle class Sinhalese. Don't worry son, we have experience in these matters. I will laugh more when the truth starts pouring out. 300 thousand people, if even one says the government did wrong. The world will listen this time. Not even India can save your asses. The Tamils ONLY want their right to govern themselves. I was in Colombo recently on a business trip. Your whole country is in a mess. Your president is a liar. Recently he stated that he would not accept any conditions on a loan. Well son, that backfired on you. To hell with the Sinhala! Thank god for the comment above. It's easier portray the extremist and racist Tamil agenda when we get their inner most sentiments out. pls world help for tamil people in Sri Lankan..